Manager Paul Hartley revealed after the 1-1 draw at home to Celtic that Dundee's "dream start" was born on the training ground. 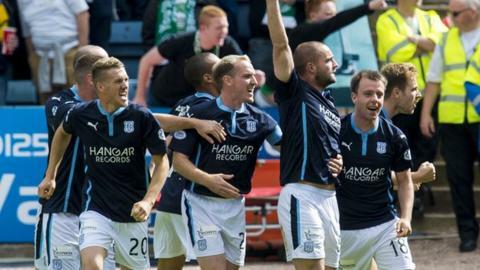 The Dens Park side were in the lead after just 50 seconds as James McPake headed in Philip Roberts' corner. Leigh Griffiths rescued a point in the second half for Celtic, but Hartley was still pleased with a point. "We've worked on that set piece for a while now and got a great goal," Hartley told BBC Radio Scotland. "We worked all week to get in behind them right from the kick-off. "After that I thought we were excellent. There were times were we broke at Celtic with real pace." Dundee could have added to their early goal with Roberts hitting the post and Martin Boyle passing up three late chances for the Dark Blues. "We were excellent," said the Dundee manager. "The players gave a great account of themselves. "I thought we created the better chances in good situations. "We looked a little tired towards the 60- and 70-minute mark and had to freshen it up a wee bit. We made a few changes which worked. "If Boyle just squares it to Luka [Tankulic] it's a tap-in." Dundee go into the international break still unbeaten, and Hartley is delighted with how his newly-promoted side have adapted to life in the top flight. He added: "It was a great game of football. Both teams wanted to attack, we don't want to sit back. "It's easy to adapt when you've got good players. They can play different formations, different systems, and they've handled the league very well so far."